Just like our facial skin, the body too needs exfoliation in order to get rid of dull and dead skin cells. Also, it is a great means of removing ingrown hair. If you are like me and prefer to shave your legs, then you must be aware of the emphasis that is bestowed to the process of scrubbing. 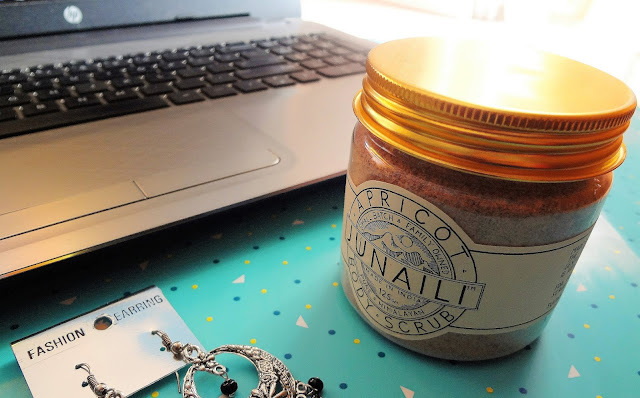 So today, I take it as a great opportunity to introduce you to JUNAILI and their apricot scrub. Let’s go ahead! Cold-pressed at 7,000 feet in the Kumaon Himalays from the finest apricots, our Oils and Scrubs are 100% Pure and Chemical Free. 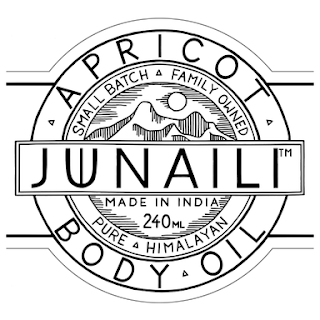 Family Owned at Committed to Sustainable Practices, JUNAILI makes and sells only in Small Batches. Our no Compromise Manufacturing Style Ensures Exceptional Quality at Affordable Price. 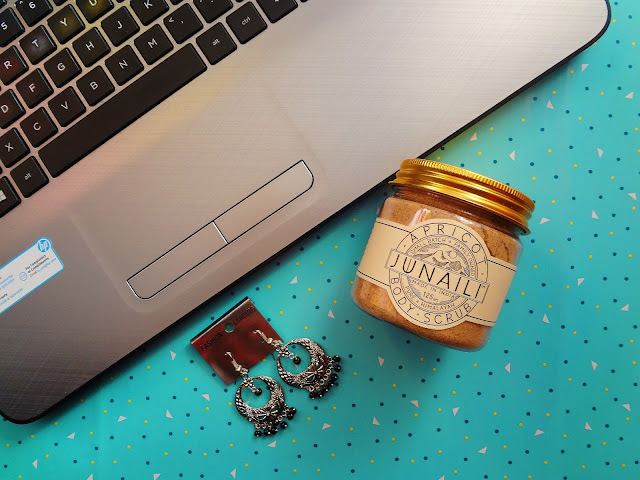 Made in the Himlayas from the Finest Plant Based Ingredients, JUNAILI’S Products are Effective & Safe. 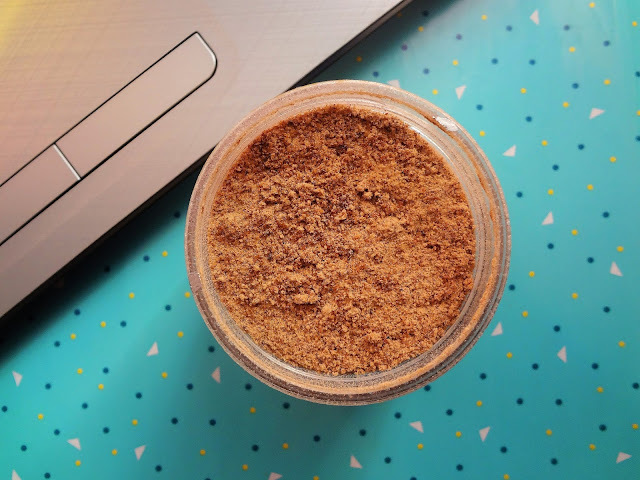 Buy Online: To place your orders for their Facial or Scrub, click here. Also, their products are available at Qtrove. Packaging: It comes in a plastic transparent jar with a golden screw open lid. Also, there’s a silver film which needs to be ripped away before you can start using it. Since it is made up of plastic and not glass, travelling with is wont be a hassle. I first tried this scrub by forming a paste using water. Then next time, I did it lavishly. With milk! 😃😉 I absolutely love powder based masks or scrubs. They can be easily customized as per your skin type and needs. The granules of this scrub are very finely milled. They are not harsh upon the skin and can also be used onto the face; only if your skin isn’t acne prone or sensitive. Since mine is extra sensitive, I form a clear cut distinction as to what is to be used upon face and what on the body. It scrubs away the flakiness and wards of dullness. As all the ingredients used are natural and there’s no artificial fragrance added, that is why, the fragrance of this isn’t very appealing. But not something unbearable of course. Final Verdict: Even if I’ve stated one con, that’s not really a negative point. It germinates out of a good intention of keeping away the skin from harmful irritants present in artificial fragrance. Though, the brand produces only two products, but the products are definitely worth trying. On top of that, they are quite affordable! So, why not? Go ahead, visit their website here and order one for yourself! *Sent to me as a part of PR practices. Not a sponsored post. All opinions put forth are completely honest.